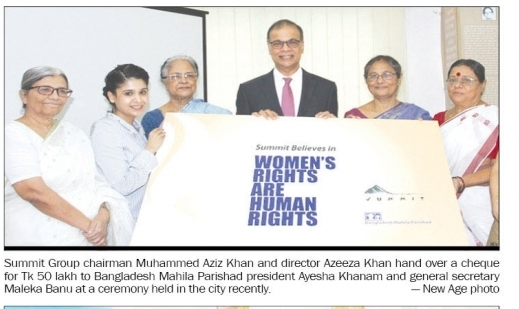 Chairman of Summit Group Muhammed Aziz Khan and Director Azeeza Khan pledged their support to women’s right organization Bangladesh Mahila Parishad. BMP President Ayesha Khanam and General Secretary Maleka Banu accepted cheque of 50 lakh taka. As part of CSR activity, Summit Group’s Chairman Muhammed Aziz Khan handed over a cheque of taka 50 lakh to BMP President Ayesha Khanam. Director Summit Group Azeeza Khan, BMP General Secretary Maleka Banu and other senior officials were present at the event. Muhammed Aziz Khan said, “How can we be economically free if every other person in the planet is not receiving their share? How can we respect ourselves if we do not respect our partners? We as society cannot thrive with only 50 percent.” President of BMP Ayesha Khanam thanked Summit for it support. Headquartered in Dhaka, the Summit Group is one of the leading conglomerates in Bangladesh. It is Bangladesh’s largest independent power producer (IPP), proudly supplying to the national grid. A visionary company, Summit has built nation’s first tank terminal, container terminal and the first independent power plant. It is a member of Bangladesh Independent Power Producers Association (BIPPA). Socially responsible, Summit was awarded the prestigious Global CSR Excellence and Leadership Award by the World CSR Congress in Mumbai, India in 2015. BMP is a women’s human rights organization. To promote the status of women of Bangladesh, BMP is active both nationally and internationally, in order to empower women, who are living in a disadvantageous position. The organization is committed to uphold the values of equality.